Since I used to offer web development services, I also created some blogs and websites for personal use as a hobby. Some of them come out of an amazing idea. Some I use as training ground. And some are purely experimental. www.jejejeje.com was one of them. www.jejejeje.com, a Jejemon site. Yes, there were a few floating around the net then! In 2010, the Jejemon phenomenon became popularly (or unpopularly) known. The cryptic text speak in the mobile world moved into pop culture and became a way of life for some. Not everybody embraced or liked it, but what was a fact was that it was getting attention. I thought of compiling online posts and and anything about Jejemon into a blog encapsulating (or annoying) the public, which I called Jejemon World 1.0 (Eow PowZ, mUsZtAh nHa?). The old domain for it was www.jejejeje.com. I chose the domain cause jejejeje was the standard laugh for jejemon. I soon discovered later why the blog was getting some views from Brazil and some parts of South America. It was because the term "jejejeje" was also the Spanish translation of the hehehehe laugh. I could've switched themes and junk the jejemon concept for a Spanish humor website. Problem is my 6 units of Spanish in college is way below an attempt to maintain a website in another language. I could be the jejejeje of it you could say. I wasn't a fan of Jejemon either so my dedication to updating the blog wasn't a priority. Eventually, the Jejemon phenomenon died down and is now more known as a reference to a pop cult than anything else. 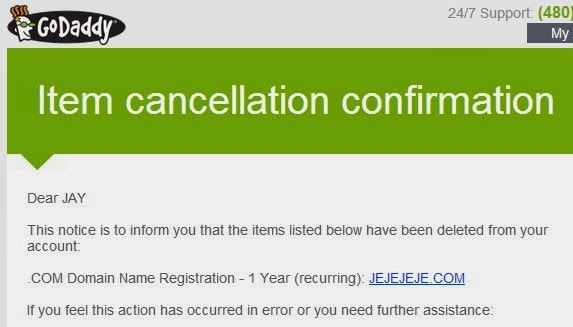 So few weeks ago, while I got an e-mail reminder to renew the domain, I decided to forego the domain. So for everyone out there interested, www.jejejeje.com is AVAILABLE! Since the blog was created on Blogger, Jejemon World 1.0 is still accessible if you want to see it or you feel nostalgic towards Jejemon. Head on to http://jejemonjejemon.blogspot.com/ All 16 posts (yeah, that many!) are still intact. What can I say for now? Jejejeje!